Training for my first Marathon (26.2 miles) is probably the toughest fitness challenge I have endured so far. With a customized training schedule and busy work and school life makes it difficult to train consistently. The other day I did about 11 easy miles at a 9:45 pace rate and will do 15 miles tomorrow. Sometimes the next day after a long run my muscles are sore and the training schedule calls for another run. During training, you need a good pair of running shoes, mileage and pace tracker device, tons of water, vitamins, nutrients from foods, sleep, sleep, sleep and of course MOTIVATION. The Marine Corp Marathon is held in Washinton DC on Oct 28, 2012. The race is currently sold out with over 30,000 runners racing from all over the world. The course consist of beautiful views of the city of DC and monuments. There is one major hill with an elevation of about 200 feet and a mile long. Therefore I have been doing a ton of hill runs to prep for the race. My goal is to finish in under 4 hours and to maintain a pace rate of at least 9:00-9:25. I bought some new Mizuno running shoes and they feel great. 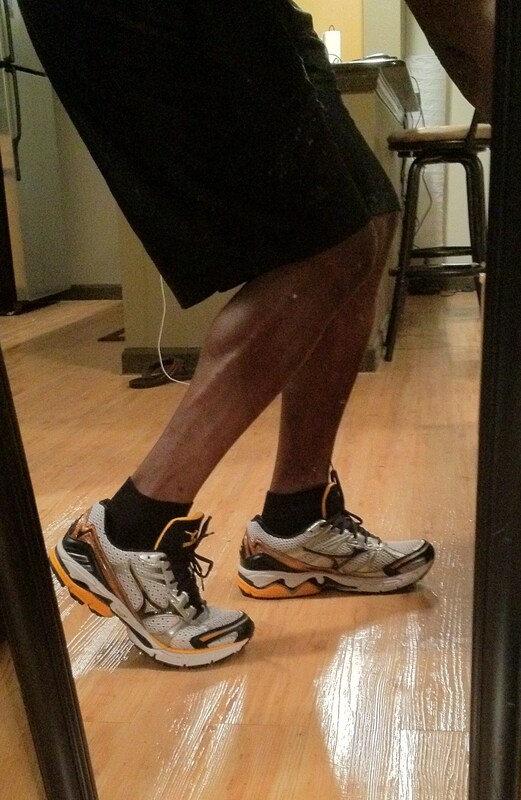 After training in these shoes, I plan to purchase another pair to run the Marathon in. With alot of Cross training incorporated into my running plan, I am sure that I will finish within my goal speed and time. I currently weight 192lbs and in which I need to get down to at least 180-185lbs before the race to help increase my speed. Training for a race can be very time consuming but very rewarding once you have accomplished it. There was no other feeling that I can describe when I crossed the finish line of my first half marathon! I realized now when I am training or even at a race that it is all mental. The pain is only temporary. With a good pair of headphones and some good music I can run all day now. Its always good to have a running partner for motivation. I am running the MCM by myself, so If you are too let me know and maybe we can run together. As time gets closer, I will keep you updated on how the training is going. If you are also training for MCM or another race let me know what you are doing to train and how the progress is going. Win, lose or draw, congratulations for taking the challenge! I’m satisfied with running 5K’s. good luck! life is all about challenging yourself) I’m sure you will succeed! You are very right, a marathon is 80% mental in my opinion! Your legs will keep moving as long as your mind is in check! Keep it up! This is what I meant to show you. That’s pretty ambitious. I believe you can do it. I could just never see myself dedicating the time to training for a marathon but I once ran a 5k. That’s cool! When was the 5k? How did it go? It was in 2007. I didn’t drink enough water. It was bad but I learned a valuable lesson. great post. I am training for my first full marathon as well and the training is intense! Don’t forget lots of stretching in the training proccess as well.! Definitely! Which marathon are you running? Awww thanks so much! Glad to know that someone out there is cheering me on! Ill be thinking of this post as I am running 🙂 Have a great weekend Susan! LJAY Health – It is so cool that you put a poll on your training post. Someday I’d like to try that as well. Thank you Theresa! Its pretty easy, I can show you if you like. Enjoyed your post, training is not easy but so rewarding! My half training is put on hold unfortunately but as soon as I get the okay I will be back at it. Glad I came across your blog. Enjoy the posts and looking forward to your challenges. Well done! I’m training for the MCM & it’s my first marathon, too! My target time is 4:30. I would love faster but I’m just going to enjoy the journey for three reasons: 1) it’s my first 26.2, 2) it’s on my birthday, and 3) ‘m running it in memory of my brother who was killed in Iraq. I look forward to following your training posts – good luck!!! WOw thats awesome! I remember training for my first half and when I completed it I felt great. Which half marathon is it? It will be the Disney Half Marathon in Jan 2013. I have plenty of time to train. The only think I was worried about was the time, but I think I will do fine. Good for YOU!! When I was “running” (I say that loosely because it was more like joggging, I am SLOWWWWWW…..) races were always my best training motivator. I am not competitive by nature, but give me a goal and FOCUS! It’s on!! Sadly years of who-knows-what took its toll and after several knee surgeries I’ve hung up my running shoes, BUT…running a marathon was a FABULOUS experience in so many ways. Wow! What a goal to have! Have fun with it. No matter what you’re a winner for pursuing the goal! WOW look at you! The London Marathon sounds exciting. I will definitely keep you updated. How many people sign up for the London Marathon? I didnt know that there was ballot. Good luck to you! Hi L-Jay, the London Marathon is always over subscribed so I’m sure they probably get hundreds of thousands applying and there are usually about 40,000+ who actually run it on the day!!! The ballot is a way of getting in without having to run for a charity, which running for a charity is a noble cause but it’s hard to raise funds sometimes when things are so financially tight for everyone at the moment. I could have ran the race this past April but I would have committed to raising £2000 (approximately ($3000+) for a charity and I couldn’t do that. Keep us posted and again good luck! I see, It seems very intense and very pressuring. Well thank you for the information and Its always good to hear from other runners. Please do keep in touch! Good luck as you train for your first marathon! I ran my first last year, and the training schedule, even for a beginner, is rigorous. Those back-to-back shorter runs turned out to be the hard part… doing the long runs with my training partner wasn’t as bad as I’d thought. But three days in a row of 7, 8, or 9 miles kept me tired… and hungry! Thank you very much! I am always hungry and my appetite has increased so much ever since I started the running plan! Sounds grueling, and I have always said that I will never do a marathon. Still, I should never say never, right? Thats right! Because you dont know If you are capable unless you try it! Thanks for the vote of confidence, and good luck to you! Kudos to you for going big. My wife is planning on running a cpl 5 & 10’s. Me? I think Ill stick with the weights, but who knows I might suprise 🙂 For recovery purposes in between runs, may I recommend supplementing with 10 -15 grams of BCAA powder if your not already doing so.. Thanks alot! Thanks for the recommendation and I will do that! Any advice or tips will be great. For you & I, or any others that do activities with a high intensity level, recovery is key. BCAA’s helped me immensely w/ recovery. Id recommend either Xtend or Amino core. Good Luck! Sounds like you’ve got a great base already built! Thanks alot! Do you have any other tips or advice? Good luck with your MCM training! I had to defer until next year (an injury got in the way of beginning my MCM training and rather than do it half-way, I’m going to spend the year preparing for next year). Plan your work and work your plan. You can, without a doubt, do this! Wow! keep up the wonderful work of juggling so many things in your life, truly and inspiration! Im training for my first 5k in October. Scared and excited. I have 3 months to train and to start i can run 1 mile in 11 minutes. Wish me luck! Wow best of luck to you Holly. You will do great on the 5k. 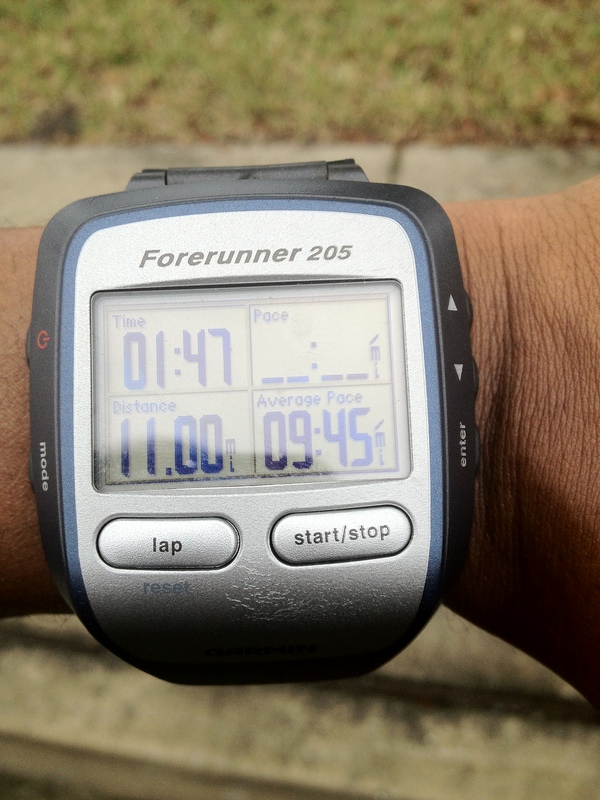 11 min mile is awesome for training for your first 5k. You are faster than I was when I first started. Way to go, that is impressive. I’ve ran a couple of half marathons prior to injury but I never felt the desire for a full. Maybe once I am completely healthy I will give it a go. What happened to you when you injured yourself?? I will check out the website, I am always looking for new shirts and gear. I ruptured my achilles tendon on the left leg during a race. The recovery from it is very long and the injury itself is mucho painful. I’m still not running any distance further than a quarter mile per my physical therapists recommendation. If I were to rerupture it I’d need surgery. Good luck! Just keep on training and stay in your groove. Awesome job training! It’s amazing the things your body can do, especially when it’s being pushed more than ever. 🙂 Following your site for inspiration in my own training! Yes its all about challenging the body and taking it to different levels! Please keep me posted on your progress! I’m also running the MCM and it’ll be my second marathon. Good luck with training!! Awesome! I’ll be wearing a shirt with my name Ljay Health on the back. If you see me give me a bug shout out!! Enjoy your training as well! Nice watch. Does it have a calorie counter, too? Mine is a T4 Polar. Thanks for the follow on my blog strawberryfreckleface.com. I’m loving this article and the overall feel of your blog; I want to go out and conquer the world just by your style!!! 🙂 Congrats for showing the world your healthy lifestyle and challenges! Best wishes with your training. I ran the Marine Corps Marathon in 2005. It was my favorite marathon. It’s good you are running hills – it will help. The hill is out the end of the race. Would you expect anything less from the Marines? When you are at the bottom of the hill my coach told us to visualize someone we liked at the top of the hill holding a rope that was tied to our waist and that friend would be pulling us up the whole way. It worked pretty well. That’s is a great recommendation regarding thinking of seeing someone at the top of the hill. How is the race with it being so many people? I would assume that everyone spreads out from each other eventually. Thanks again!! i’m registered with a friend for the MCM10k. i did my first virtual half last week and i have my first official one in october, but i’m not so sure about going for a full marathon. i like to tell myself that i don’t have the time to train for it, but i think in reality it has more to do with me not knowing if i can handle that many miles!! Wow, your time goal is pretty impressive. I hear you about finding the time to train consistently. Well, try to follow your training schedule 90% of the time, don’t sweat the few runs you might miss, The weekly long runs are really the most important. I havent run marine corps but have had a lot of friends do it and love it!! honestly i think running your 1st marathon by yourself is a great choice- it really helps to look back and realize it was you and you alone that had the will and the strength! dont get me wrong, I love my running buddies, but I will never forget my 1st marathon and am so glad I did it on my own. good luck!